René Guenon had a far-reaching vision. His life covered a critical turning point in history, encompassing great changes. With the book, Crisis of the Modern Age, Guenon was seeing what he called the Kali Yuga, the ending of a Great Aeon or Mahayuga, and the sinking into dissolution of all real knowledge. René Guenon died in 1951 and could not have foreseen exactly how things would turn out half a century later. Yet much of what he wrote concerning the distortion of symbol, language and the meaning of things, the loss of tradition, everywhere prevails. 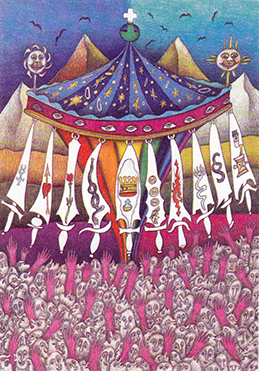 Ten of Swords from pop art Neuzeit Tarot, Walter Wegmüller, AG Muller 1982: The card depicts ten swords, bearing nonsensical motifs and depending from a crazy carousel. The masses look on, enthralled by the illusion or otherwise self-absorbed. Grasping hands vainly reach upwards. Reason has become indistinguishable from the absurd and irrational. The Kali Yuga, according to Hindu scriptures, is the Age of the Demon. The ‘demon’ is the force that opposes all spiritual knowledge, bringing on a long Dark Age of materiality. With the culmination of Kali Yuga comes the final dissolution, preparing the way for the birth of a new Mahayuga cycle. Lasting for more than 6000 years, Kali Yuga comes as the fourth and final phase in a Great Aeon. The working out of these ages of time by Eastern philosophers seems to have incorporated full knowledge of the astronomical precession of the equinoxes. According to the astronomer and sage, Aryabhatta, writing fifteen centuries ago, Kali Yuga began around 3000 BCE. We have more than a thousand years of Kali Yuga before a new Golden Age dawns; by that time there will be nothing left of our present civilisation. Aleister Crowley’s theory of three Great Aeons is very unsatisfactory, as evidenced by his garbled account of it in The Book of Thoth. Crowley tried, unconvincingly, to equate his aeonic theory with the precession of the equinoxes, though he did note that we are now entering the precessional Age of Aquarius—a mere 2000 years in the great precessional cycle of 26,000 years. The Egyptian Book of the Law, Liber AL vel Legis, has very little to say about aeons or ages of time; there is no account in the book of any New Aeon. The passage that refers to Crowley as “the prophet”, Liber AL I: 26, was expressing his own thoughts and questions on the book—he gave himself that appointment. In the same verse Crowley appealed to Nuit for “a sign”. That is, he sought a sign or token of his own supreme authority. It becomes clear that while receiving and recording the transmission, Crowley’s meditation was constantly disturbed by his desire to resurrect the fragmented Order of the Golden Dawn with himself as leader. He thus misconstrued the book’s true import. However, if we study the Egyptian Book of the Law in the light of the precessional ages, of which the last is the apocalyptic Kali Yuga, it becomes clear that, so far as the book is concerned with time at all, it describes the present time as the final phase of the dissolution of a Great Aeon, a Mahayuga. The book then provides the keys for an Initiate to survive the dissolution in spiritual terms. We must exercise careful discernment when studying this book: while the revelation concealed in the text did not spring from the mind of Crowley, there is much other content that did, or that was influenced by his insistent thoughts and demands. The talisman that unlocked the 93 Thelemic Current, unleashed on Aleister and Rose Crowley in a hotel room in Cairo in 1904, was the Stele of Revealing, discovered in the Museum of Cairo by Rose. It was the funeral stele of an Egyptian high priest that served in the Temple of Karnak in Thebes, around 700 BCE, and named Ankh af-na-khonsu, ‘Life and Soul of Khonsu’. Khonsu is the Egyptian deity or Neter revered at Thebes, and particularly associated with the Moon. The Moon was in turn associated with the counting of time. There is no need to go further into the historical details here. What is important is that the spiritual law encrypted in the funeral stele of Ankh af-na-khonsu came near the end of the long ages of ancient Egyptian civilisation. In another thousand years the language would be completely forgotten. Even by Hellenistic times, the old Gods of Egypt would only be studied academically by Egyptian priests. Crowley’s reception of the Book of the Law in 1904 coincided simultaneously with the death of the Romantic era in Europe and the unmitigated onslaught of a Dark Age more terrible than any other—a time in which countless numbers of human beings on earth would be crushed by mechanised industrial warfare on a vast scale. When nations are not directly concerned with industrial subjugation or mass extermination of their own species the war becomes one where the weapons are either psychological or clandestine. We have arrived at the present time. There are very few people today who have heard of Plato and Aristotle. Not one in a thousand, perhaps ten thousand, of those few have ever read either of them, even in translations. But there are also very few people whose thinking, such as it is, is not conditioned by the ideas of those two men. The emphasis, “such as it is”, is ours, not that of the author. Crowley was observing a decline in the ability of people to think coherently. In the twenty-first century there are now very few persons capable of concentrating their minds on one thing to the exclusion of all else. People now spend more time at work in a job, or two or three jobs, than at any other time in history. A few decades ago there was a lot of talk about how things would be in the future. Everyone imagined there would be more leisure time. Machines would take care of mundane tasks, or accelerate tasks so people had more time to themselves. That future has arrived now, and the opposite has occurred. With the sovereign role now played by Information Technology, many people spend hours a day looking at virtual displays on a phone, tablet or computer. They listen to digital ‘music’ in headphones while they are performing various tasks—a degradation of both music and listener. Their consciousness is buried beneath multiple layers of wallpaper distractions. Whereas at one time a person undergoing Hermetic training had to learn how to control their own thought, the information addict is already the slave of everyone else’s thoughts, however banal. Literature is being replaced by digital images and icons. No matter how high the resolution, a digital image can never be more than dots creating an illusion of form and space. Virtual reality is a lie; the software illusion is not ‘near’ reality, it has nothing to do with it. The same applies to digital music, film and television. We are told by business professionals that very few people will actually read the present article. Though it might score millions of website ‘hits’, we understand that most people do not actually read the information on websites or other forms of digital media. What they do is scan the information—the person runs their eye quickly down the content, searching for something appealing. Businesses make large amounts of money from mouse clicks. There is no need to think. No precious time in which to calculate the loss of a thing that cannot be bought or sold, a thing that once lost is lost forever. It is no longer about thought or imagination, which takes far too much effort. It is about comfortable self-identification. Corporations do not make profit from moral and intellectual strength; they make profit from moral and intellectual weakness. Absorption in the digital delusion kills the intellectual and imaginative faculty that is needed in magical or spiritual practice. Although the pursuit of magick and mysticism was always for a small minority of persons, it has become more difficult in the technological age. However, it has always taken great moral courage to get anywhere with real magick. The courage to stand against the flow of fashion, to resist the mundane world and the pressures it places, the tendency towards the economically driven distraction and diversion in things alternately banal or horrifying. To paraphrase Crowley, one must earn the right to do Yoga by managing one’s time and life to make room for it in the first place. When René Guenon commented on the modern age he used the term, ‘anti-initiation’. If initiation can be the transmission of knowledge, then there has to be an equal and opposite idea. Guenon observed a powerful movement against initiation in the modern world. He denounced many of the occult traditions from which we have taken influence. That clearing away, the denunciation of all that was not harmonious in his universe, was part of the personal initiation of René Guenon, and yet what he wrote has universal implications. Guenon could have little idea, at that time, of the massive rise of popular culture that took place in the 60s and 70s and that has continued onward to the present day. Pop culture, with all its genres and fashion cults, is a powerful force against initiation, real knowledge and meaningful tradition. Advertising, television and social media are all forces against initiation, whether blindly or no. Guenon was seeing the emergence of what we may now term as the New Age movement. The New Age is a general term that includes many quasi-spiritual ‘paths’ that lead nowhere but to dispersion of mind and the wasting of the soul. Yet they all claim to confer magical powers, ‘healing’, self-mastery and even spiritual enlightenment. More insidiously—though it is openly supported by pop culture and New Age spirituality—there is now a very disturbing movement of anti-intellectualism in the West. Anti-intellectualism and totalitarianism have always gone hand in hand. The blinding of words by the confusion of language has always served the authoritarian anti-intellectual movement. That service is done in the name of freedom, in the name of equality and in the name of individualism—even where there is no real individuality, no freedom and no social justice. The Real is eternally true. Human reason and ego does not touch it, for these have no ground in the Real. Every mystic tradition for thousands of years has told us that. Civilisations rise and fall—history tells us that. The present technological age will certainly come to an end—everything does. None of that makes any difference to the Real, and what is eternally true. One must not fall into despair. That is a false trail, for despair is itself a force of anti-initiation. There is still plenty of the natural world left, although it is fast declining under the advance of human technological and industrial totalitarianism. If we switch off our digital devices, phones, computers and other gadgets, leave our urban environments and go to the woods, the sea—if we learn to understand the language of birds and wild creatures, come to understand the subtle vibrations of plants and trees, of the sun, the moon and the stars—then we will be closer at least to the Real, to something truly authentic. No man, not even the greatest thinker, philosopher, guru or mage, can prevent the sun from rising and setting or command the moon to change her course. No one can start or stop the revolution of the Great Wheel of the Aeons. What we can do is prepare ourselves spiritually so that, like the Egyptian high priest Ankh-af-na-khonsu, we may “open the doors of Nuit”. 2. The Book of Thoth, pp. 33. 3. Aleister Crowley, Eight Lectures on Yoga. This entry was posted in Philosophy, Thelema and tagged 93 Current, Aleister Crowley, Kali Yuga, Liber AL, magick, Mahayuga, prophecy, René Guenon, Thelema by admin. Bookmark the permalink.